Right now ears of sweet corn are in abundance at grocery stores and farmers markets. We wanted to do something different and stumbled upon this dish in our research during the World Cup as we were looking for South American recipes. Popular among Venezuelans and Colombians, cachapas de jojoto are slightly lumpy corn pancakes that can be as large as a nine inch skillet that is folded over and stuffed with cheese. Sold in many snack shops and endless roadside stands, the corn pancakes are often served as appetizers or simply as a quick savory snack. 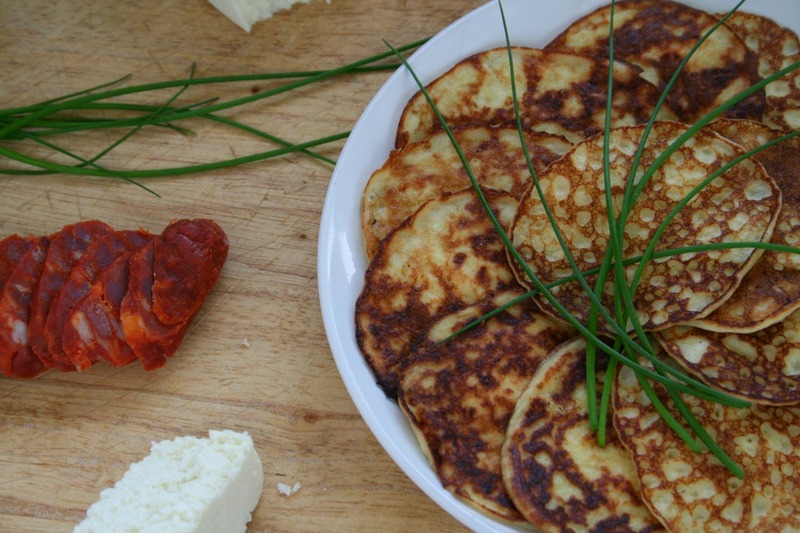 The corn pancakes are usually eaten with fresh cheese and sausage or fried pork skin. 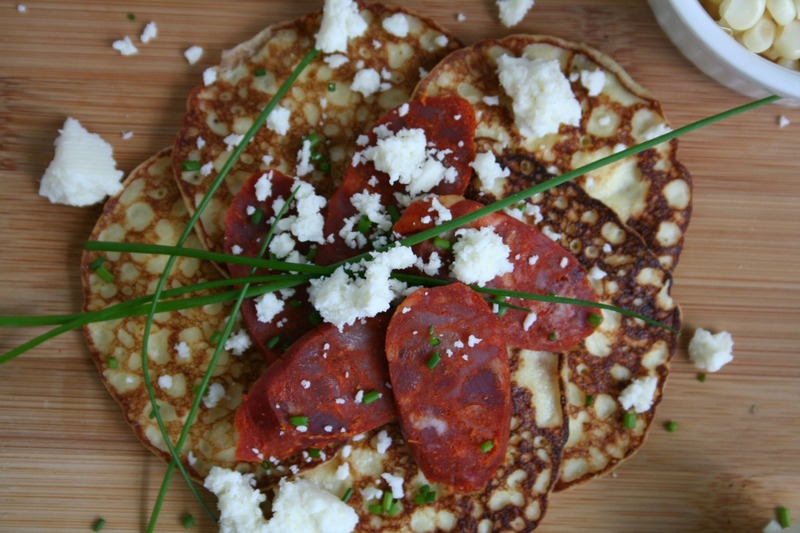 This recipe yields small cachapas, or cachapitas, for a sophisticated appetizer or breakfast that is still grounded in tradition. Place the corn, cream, eggs, flour, salt, sugar and 1/2 tablespoon melted butter in a blender and puree until smooth. It should have a batter-like consistency. You can add some more cream if it is too thick. Heat a griddle over medium heat. Brush it with some melted butter, dropping a tablespoon of batter for each little pancake. Brushing the griddle between batches. Cook on both sides until golden brown, about 3 minutes each side. The pancake does not rise so do not be alarmed. 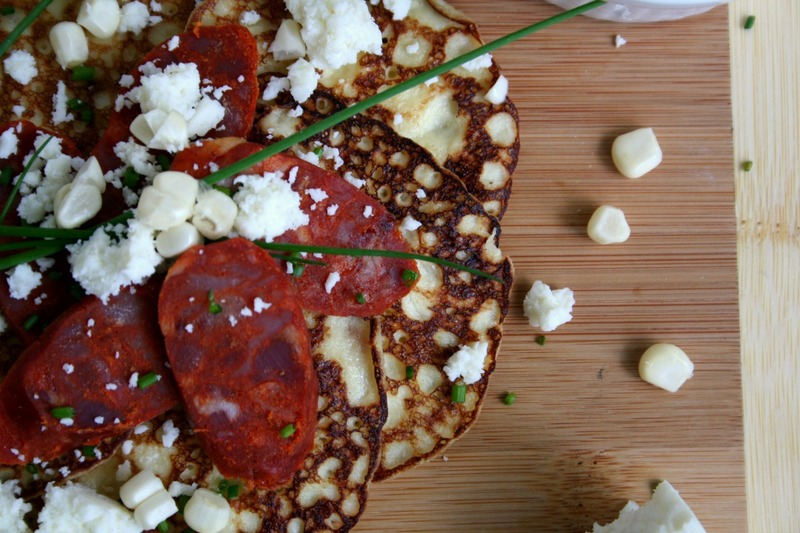 Evenly divide the sliced Spanish chorizo and crumbled cotija cheese and serve atop hot corn pancakes. This looks so delicious and so easy. I love corn pancakes in any variety. And I can taste the cotija making this pancake amazingly perfect! Thanks Luci! Let us know if you decide to try this easy recipe.